Alfredo Deambrosi joins us for the second half of his video Interview. Alfredo Deambrosi has a couple more questions to answer. 7) You have another video course specifically for business writing. What is the biggest problem that learners have when it comes to business writing and how can this course help them? Alfredo Deambrosi: The biggest problem with weak writing in the workplace is that it fails to serve the needs of listeners and readers. If your business communication does not serve your audience, then there might be a number of reasons. You're more concerned with sharing your perspective than with listening and understanding your reader's perspective. You’re more concerned with saying what you want to say than with saying what your audience needs to hear. You’re trying to impress your readers instead of serving their needs. You're trying to use big words and complicated expressions instead of using plain language. You're more concerned with sounding eloquent than with having a conversation. All of these are major problems that fail to serve the needs of readers. In our video course called Business Communication Targets, Holly explains how to remove these problems from your thinking and your writing. And she shows you how you can communicate effectively when you're at work. 8) In your experience, what is the biggest mistake that English learners make? What holds people back or limits their learning potential? Alfredo Deambrosi: The biggest English-learning mistake is not knowing what kind of mistake you are making. Here is what I mean. There are 3 kinds of people who fail to see progress. And if you're not making progress, you might ask yourself, am I one of these kinds of people? The first kind of person who fails to make progress is an undisciplined learner. This is the person who does not take time to practice every day or every week. Most English learners who see this interview probably do not fall into this category, but it's possible. The second kind of person is the disciplined, active student of a failed system. These learners study and practice several times every week, or even every day, but they see that a lot of other English learners are making progress much faster. The problem is that the disciplined student of a failed system needs to change the system. The third kind of person who fails to make progress is the actively unfocused learner. Now, what is that? An actively unfocused learner changes strategies too quickly. Both the second person and this third person are active. But, instead of actively using a failed system, the third kind of person changes strategy too frequently. This person lacks focus. Identify which kind of person you are, if you are not making enough progress in your English learning. Take time to find an effective strategy for learning. I recommend that you take only a few days or a few weeks, at the most, to do this. Be disciplined with your new strategy. Make a plan to study and practice English frequently. Changing habits is difficult. But I really, really hope that some English learners who see this interview will make the changes that they need to make. I would love to learn about English learners who see some amazing improvements, as a result of following one or more of these tips. 9) Do you think that social media is helping people improve their English or just a distraction? Alfredo Deambrosi: Social media can help you learn English. Here is the main value that I see in social media. It can give you motivation to make a commitment to keep improving your English skills. If you post or tweet with a native English speaker, and if the native English speaker understands you and responds, you just had a short conversation with a native English speaker. That's cool. That's exciting. And it can give you the motivation that you need to keep improving your English skills. Building motivation is the main value of using social media for an English learner. Now, I also believe that social media has some value in helping you learn English. In fact, we use social-media activities as part of our plan for English learners at OnTargetEnglish.com. Social media gives you an opportunity to practice your English reading and writing. Some Twitter users and Facebook pages post regular tips for learning English; those can be quite helpful. And more and more social networks are including tools for video chat; so, in that sense, using social media can also help you to improve your listening, your speaking, your pronunciation, and your general English-conversation skills. I will make this caution, though: I don't recommend using social media as your primary method for learning. In other words, I don't think that many English learners will become fluent just by reading and responding to posts on Facebook and tweets on Twitter. But social media does have instructional value, and I believe that it has even more motivational value. 10) Do you have anything else you would like to share today? Alfredo Deambrosi: Yes, I'd like to tell visitors to take advantage of the amazing variety of resources at helping-you-learn-english.com. Diana has spent years creating a valuable online destination for English learners. Visit often; stay connected; interact with Diana and with other English learners online. I also invite you to watch 5 free videos that Holly and I made on "Improving Your English Skills". These videos are filled with dozens and dozens of valuable tips for improving your pronunciation, grammar, speaking, vocabulary, and conversation skills. Alfredo- Thank you, Diana. It was an honor. 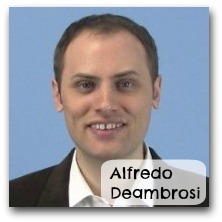 If you liked this interview with Alfredo Deambrosi you might enjoy these interviews as well.